without the traditional need to store and heat water 24 hours a day. In September, 2003, we installed our Takagi T-K2 instantaneous hot water system to replace our worn-out, conventional 40-gallon water heater. We have eliminated standby heat losses of the old storage tank and expect to reduce energy consumption 20% to 30%, even up to 50%. Cold water enters through a pipe into the small, wall-mounted unit about the size of a suitcase. The gas burner begins heating the water on demand only when we turn on our hot water faucet, causing the water flow to electronically activate the pilot light and powerful gas burners. It can provide 240 gallons per hour of hot water -- flows ranging from 0.6 to 6.9 gallons per minute -- with no tank and thus never the problem of running out of hot water. There is no more storage tank clogging with deposits and rust, and no pilot light to waste gas. The computer-modulated burners use only the gas required, according to demand. Water is only heated as it is used, without need for a holding tank to waste energy. 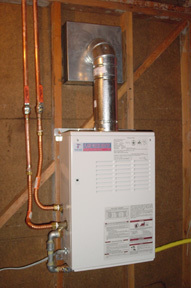 Computer controlled electronic ignition allows the gas water heater to operate without a pilot light and save up to 50% off utility costs. Safety is constantly monitored internally with a system of circuits and sensors constantly checking for over- or under-heating, freeze conditions, gas levels, water levels, even air and venting conditions. In 5-7 years we expect the energy-savings to reimburse us for the extra expense above that of the traditional, more energy-efficient gas hot water tank, whose life expectancies of 10-12 years will be far-exceeded by the tankless water heater.